What Is Killing My Gains? I doubt anyone in history has ever said that! I doubt anyone actually will…BUT now that I have your attention, I want to talk about gains and why some of us aren’t having any. 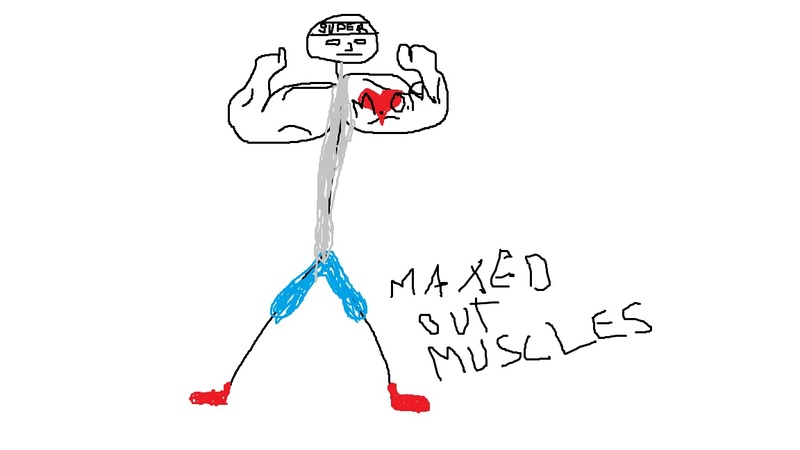 About as strong, in fact, as this stick figure that I hastily drew in Microsoft Paint. Look at those biceps!! However, he did skip leg day which I would say is pretty bad! Now jokes aside, all of us hit plateaus or walls in our training and it can be pretty depressing. I know because this has happened to me, and is happening to me now. So I write today as optimistic as I can! I don’t know from experience that I will overcome this plateau, but I am optimistic! Diet is probably the easiest to call out because, without proper nutrition, how can your body grow? There is a lot of controversy on diet(feel free to post your opinion in the comments). A lot of bodybuilders and strength coaches say you should eat whatever your basal metabolic rate calls for while eating a gram of protein per pound of body weight. However, some text books say you should eat no more than 60% of your body weight in protein and other people recommend 50 grams a day. I personally feel that the gram per pound approach will be most effective for me personally. This is because, when I look at other people who have been bodybuilding(natties included), I notice that most heavy lifters recommend eating a lot of protein. A lot of them have good aesthetics too, and it doesn’t look like they converted any excess protein into fat. This is my other point and what I feel is the kicker for me lately. As I work full time, have a part time job, and enjoy some time to relax..
it gets REALLY hard to even want to lift on some days. It even becomes difficult to write these posts on other days. However, I am consistent and self-motivated! No matter what life is tossing me, I will strive to continue what I started. Now, it has become depressing to work out and see little results lately but as I’ve been consumed by other things I realize that it is a feat in and of itself that I’ve made it to the gym and maintained. ..and I’d like to add that today I worked out hard!! And it felt GREAT! So no more complacency in the gym, and a better diet is not my recommendation; no complacency in the gym and a better diet is my prescription! It’s always time to continue fighting the resistance we have in front of us and put our best foot forward! Today is that day, and so is tomorrow. Do your best and make some gains! You know those people that have to be better than you, and if they aren’t they’ll cut you down? Don’t listen to them! If there’s one thing your passionate about and you love doing, then feel free to talk about it and maybe brag about it occasionally. I’m not saying you should be one of those douchey people that talks about themselves all the time, but if you want to talk about your achievements once in a while go ahead. If you like to talk about weightlifting, go ahead. At the end of the day, if someone tries to say “I’d rather not talk about weightlifting because I’m humble” or something like that to you, they’re just bragging about how they don’t brag. Don’t listen to them; they’re the type of people with low self esteem who just want to bring you down so they can bring themselves up. Again, don’t talk about yourself too much, but feel free to be proud of what you’ve done if you earned it. Remember, that if someone humble brags to you and acts like they’re higher and mightier than you, that they probably aren’t worth your time.